With Thanksgiving looming on the horizon, I’ve been busy preparing my meal plan. We are expecting a couple out-of-town guests who haven’t seen our new place. I want to make sure everything is ready for their stay. It’s not only Thanksgiving dinner that I need to think about, but also what to serve for breakfast on Thanksgiving morning! We could go out to eat and spend a fortune, but I know that I can prepare an even better breakfast – and one they will remember! I have the perfect breakfast recipe in mind. It’s sweet, indulgent and filling. This is no ordinary breakfast casserole. 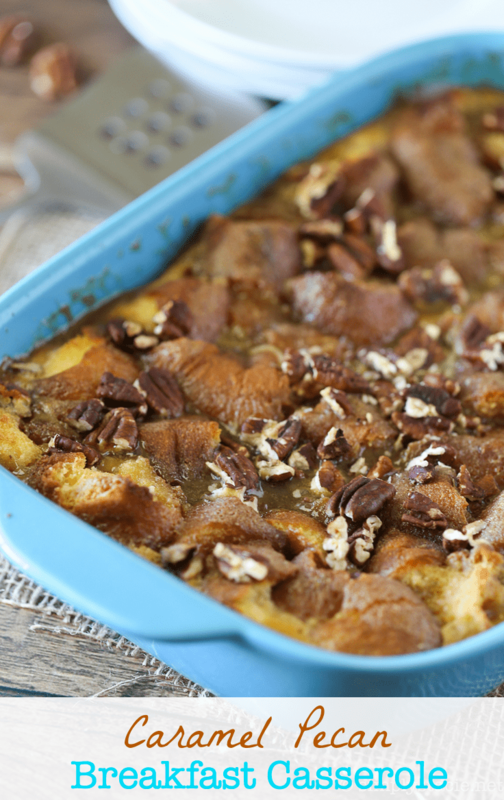 I’m making my Caramel Pecan Breakfast Casserole with the help of my new 3 quart casserole dish from CW by CorningWare! I adore this 4 piece set! It comes in four sizes of durable stoneware casserole dishes in beautiful bright colours. Stack them together for easy storage. They are also oven, microwave and dishwasher safe. Since I’m feeding my family and a couple guests, I’m using the big one. 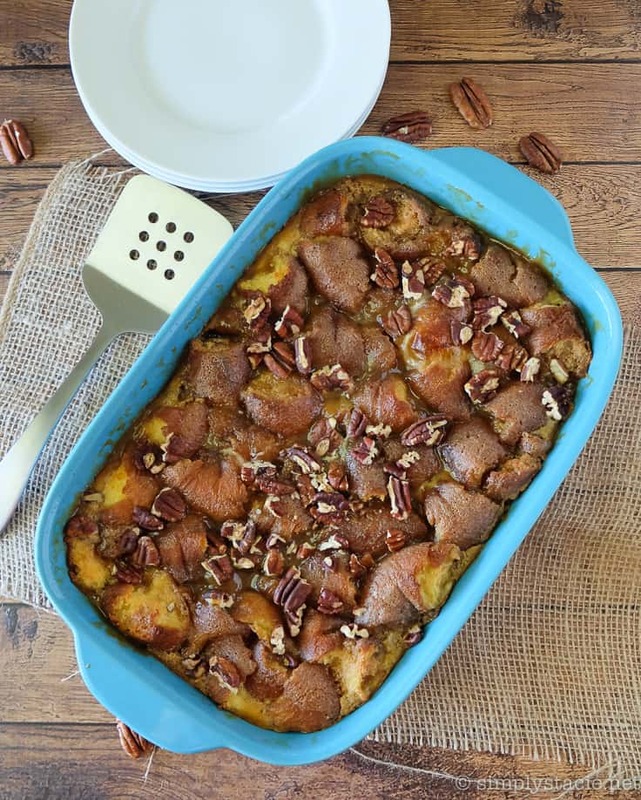 It’s the perfect size for this breakfast casserole recipe. The beauty of this recipe is that you can get some of the prep work out of the way the night before. I bought a half dozen donuts at the grocery store and then broke them up into small pieces. 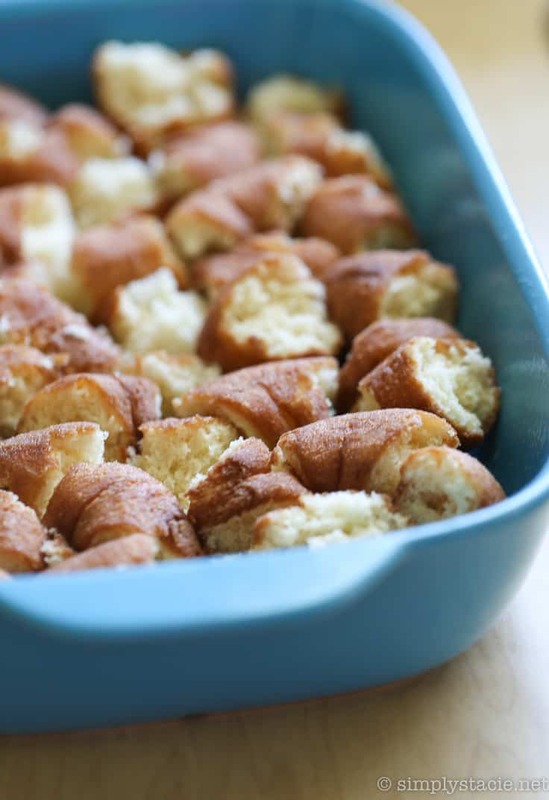 Spread them out on the bottom of your greased casserole dish. Whip up the egg mixture and pour it over the donuts. Then cover and refrigerate it overnight. Half the work is done! However, if you forgot to do these steps the night before, don’t worry. The recipe will still turn out fine if you do it the same day. I make the caramel on the stove top using brown sugar, corn syrup and butter. Pour it over the donuts and then top with pecans. Now, it’s ready to bake. The delicious aroma that fills my home is mouth watering! If it doesn’t get everyone up in the morning, I’m not sure what will. 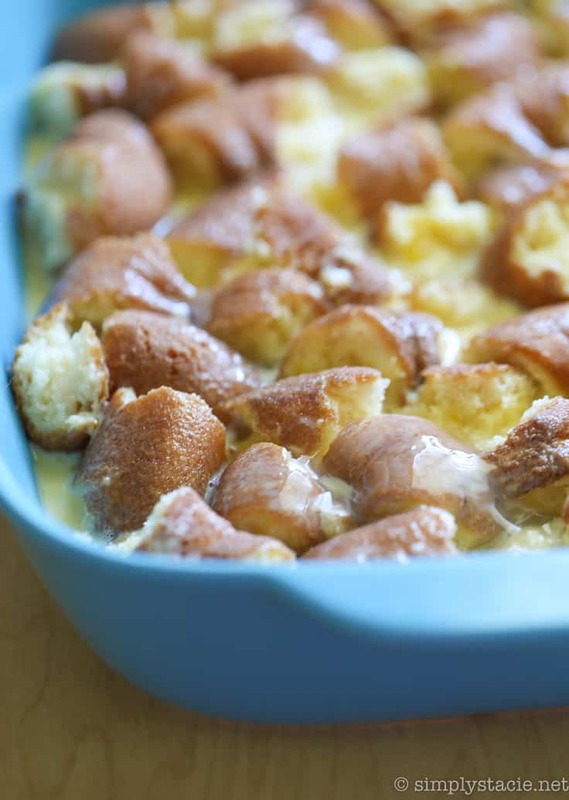 The egg mixture is custard-like nestled into the sweetness of the donuts. 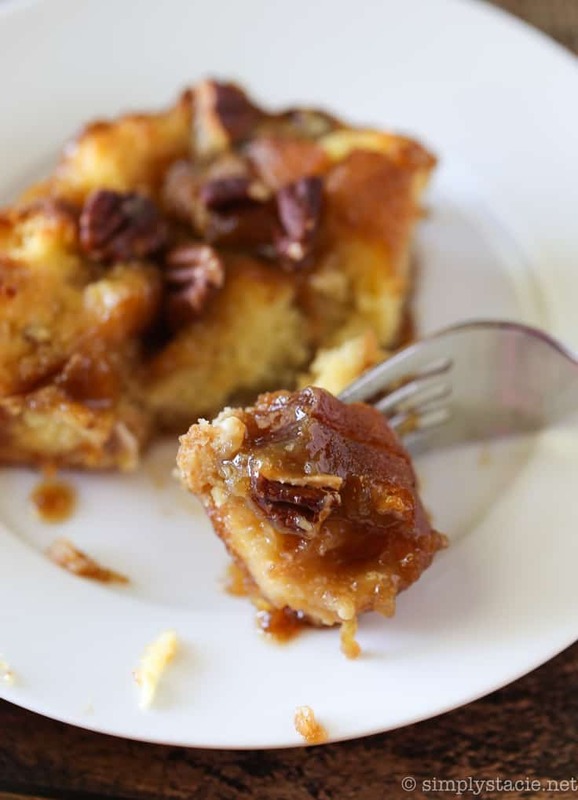 The caramel and pecans complements the dish making each bite an explosion of sweetness. You will need to have a sweet tooth to eat this dish. Good thing we all do here! It’s ok to indulge every once in a while. Plus, it’s a special occasion so why not! I cannot wait to eat to make this again! 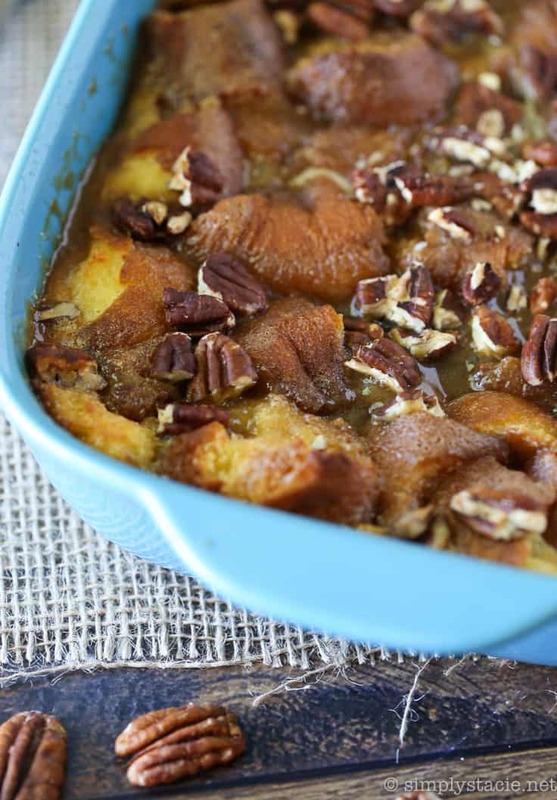 It’s one of my favourite breakfast casseroles to make. It also has a beautiful, eye-catching presentation with the pop of blue on the CW by CorningWare dish. After breakfast, I’ll put it in the dishwasher and then can use it again (along with the others in the set) to prepare my Thanksgiving dinner! 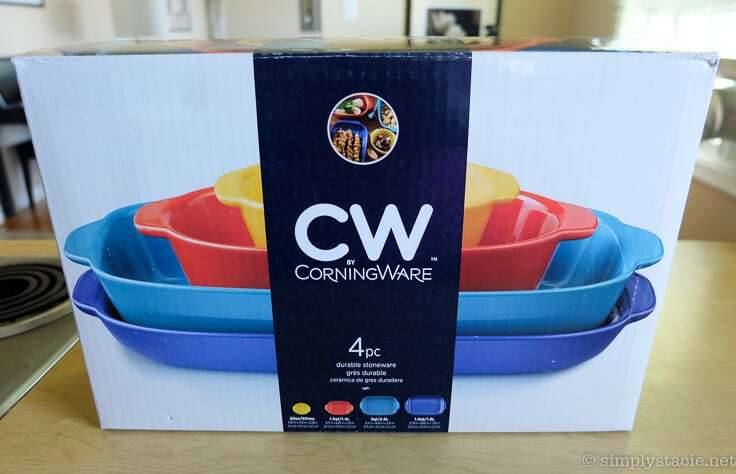 Visit CorningWare to find out more information about this set and to pick one up for yourself. What are your plans for breakfast over the Thanksgiving holiday? 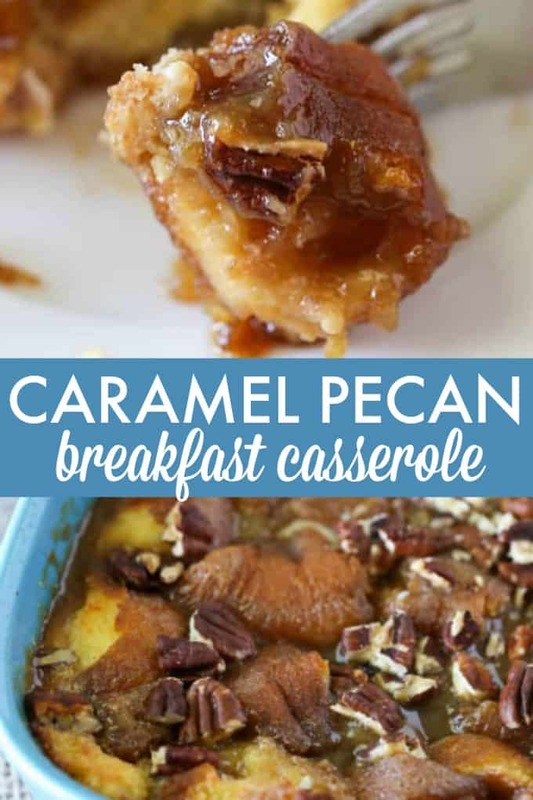 Indulge your sweet tooth with this simple and decadent recipe for Caramel Pecan Breakfast Casserole. 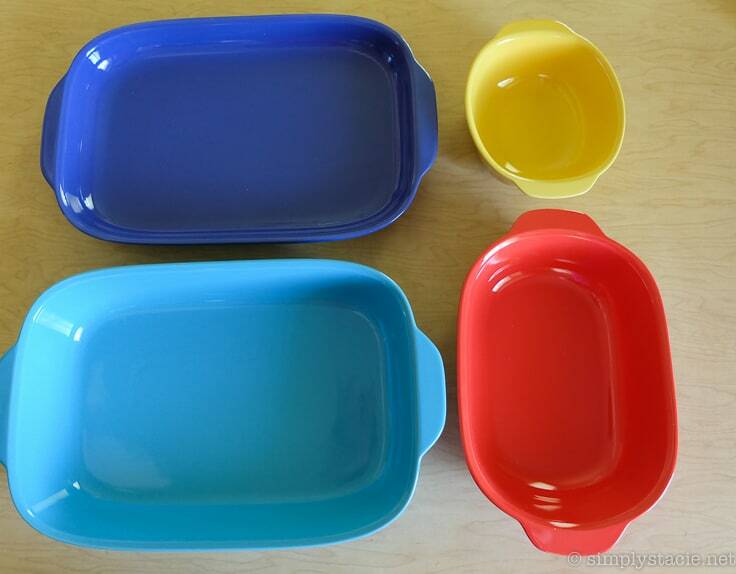 Grease a Corningware CW 3-qt. Pool Baker with cooking spray. Arrange donut pieces to cover the bottom of the dish. In a large bowl, mix together eggs, milk, vanilla and salt. Pour evenly over donuts. Cover and refrigerate overnight. To prepare the caramel, heat brown sugar, corn syrup, butter and salt in a sauce pan over medium heat. Stir till the butter is melted. Remove from heat once mixture starts to bubble all over. Add in 1/4 cup heavy cream and stir to combine. Then add the last 1/4 of heavy cream and stir to combine. Let cool a few minutes before pouring over the donut mixture. Sprinkle pecans on top. Bake for 30 minutes in a 350F oven or until golden brown. Serve hot. Disclosure: This post is sponsored by World Kitchen. I was compensated monetarily and with product. All opinions expressed are my own. I’m planning a variation of my standard scrambled eggs and fruit. I always feel better when I stick to a low fat, low sugar breakfast. A bacon, egg and cheese strata is our family’s choice for Thanksgiving breakfast! Left over ham for eggs benny casserole – I think I g0t that recipe from here btw – love it! Oh my goodness! This looks fantastic! A local place here has discounts on their day old pumpkin doughnuts and this would work out sooo well for that! We do pancakes or waffles, caramel pecan sounds amazing. I love pecans. We are making Bacon eggs and homefries. We had toast and tea or coffee because we would be eating so much at dinner. Wow! Drool alert! This look so delicious. We have had three “bouts” (for lack of a better word) with out-of-town company in the past couple of months. It would have been wonderful to have had this recipe then. Well, clearly I am prepared for the future. Thanks, as well, for the introduction to such lovely Corning ware. I had no idea they made such pretty casserole dishes. Boy, can I use these. I made some bacon, eggs, and toast. For Thanksgiving waffles loaded with maple syrup is our family tradition. 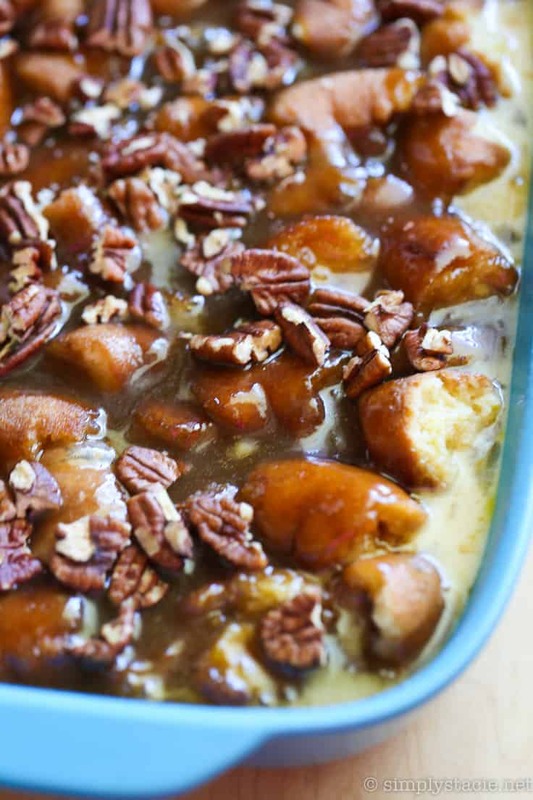 I think that this ‘breakfast’ casserole would also make an amazing dessert. It’s making me hungry. Awesome recipe and awesome giveaway! Thank you Simply Stacie! I think I’ll be making eggs, bacon and biscuits for breakfast that day. I will be making bacon and sunny side up eggs,toast,and hash browns.It’s our favorite way of having breakfast. Since this giveaway is over, I feel I may comment on this wonderful dish. 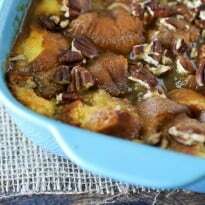 This would be a wonderful dish for Easter Morning or Christmas Morning or some other special day. Thank you so much for this recipe. I have saved the recipe. 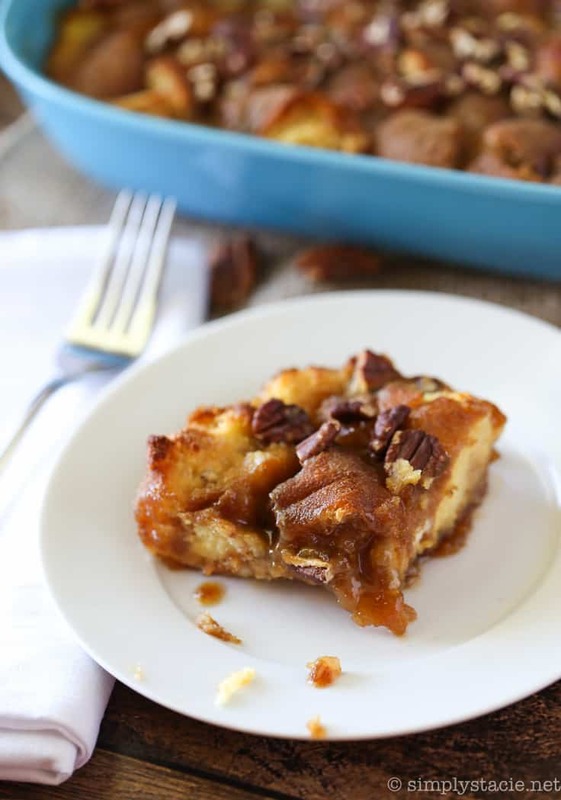 Caramel Pecan Breakfast Casserole Is this make with glazed donuts or with cake donuts? I used plain cake donuts. Glazed should work though too. Question…. do you have to let it soak over night or could you cut that time? You don’t have to let it sit overnight. You could do it all in the same day and it will be fine.